If you go searching for free tarot resources on the interwebs, you’ll go down a deep rabbit hole of content and for the beginner, that itself could be just as daunting as the process of having to learn tarot. Which one do you really start-start with? Isn’t there an easy linked “Lesson 1” and then you can just go from there? Here I’ve compiled for you a list of five (5) beginner sources that are essentially free online tarot courses. These courses are self-paced, yet guided by a tarot master, structured, and with substantive content I’ve vetted, reviewed and felt, wow, yeah, okay, this is good stuff. Also, in assembling this list, I tried to look for resources that had some nice polish to them, were well-designed, well-produced, aesthetically-pleasing, and not too smarmy with any efforts to sell you something. So, to be fair, there were several pretty good sites that I’ve left out from this list because ultimately, it was geared toward selling you something. An important criterion was the site had to be, overall, leaning more toward “educational purposes” than toward “promotional purposes.” Another important criterion was that the tarot lessons were well-organized and easy to follow. Some of you may know of the online video companion course to Holistic Tarot already. I put out the first few video lectures for the series this past week. The videos supplement the study guides and handouts, which supplement the book, Holistic Tarot. To check out the course outline and description, click on the above hyperlinked banner. This blog post is just to offer some of the behind-the-scenes commentary. Still I got pressed. Apparently that wasn’t what many of you folks had in mind when you think “beginner’s tarot course”? Holistic Tarot gets criticized for allegedly being unkind in its treatment of practitioners of craft, in particular witchcraft. Folks have interpreted my book as proposing that the magic of divination ought to be stripped of tarot entirely and that I’m telling you to approach tarot from a staunchly atheistic point of view. I wonder why for so many, life choices must be so mutually exclusive. Why does my personal spirituality let alone religious beliefs need to be apparent in everything that I produce? The book’s tone has never been shy or misleading about taking an academic approach to understanding tarot. That is hardly a concentrated attempt to strip magic from tarot, an allegation rendered even more absurd if you know anything about my personal background. Also, I wrote Holistic Tarot as a beginner’s tarot book with a specific target reader in mind. My intention for the book is to get you to a level of technical mastery over tarot. Technical mastery. That means yes, in the beginning, magic is stripped of the tarot the same way when you first learn a musical instrument for the purpose of someday mastering it, you strip all artistry from the practice of that instrument. During your first 10,000 hours of lessons for mastering violin, it’s about how you hold the bow, how to string your own instrument, how to straighten your own bridge, how to tune your instrument, how to hold a whole note with no vibrato, not allowing you to use any vibrato at all until you’ve mastered your bow work, then how to master the vibrato, perfecting the execution of various techniques, rote learning, stripping you of all personal creativity and compelling you to learn technique your teacher’s way, playing boring scales and etudes until your fingers are blistered and your neck is bruised. It’s hardly musical at all. You could argue that such an approach is stripping the musicality from music. Blue and black, white and gold? The parable of the elephant, witness testimony, and the relationship of artist and critic. One summer in my childhood I was forced to attend a Buddhist camp at a monastery where we woke up at the crack of dawn to do shaolin and meditate, ate vegetarian, prayed our gratitude to everyone we knew and ever met before we could eat said vegetarian food, and had to sit in uncomfortable cross-legged positions while listening to lectures. Don’t forget the supplements! Those are very helpful (or so I claim). Be sure to check out all Holistic Tarot study guides and supplemental downloads here. Now I bring you the Study Guide for the Advanced Tarot Student, and also for the tarot practitioner who is seeking to go professional. If your objective is to go professional, however, this study guide alone (and the Holistic Tarot text) is not going to suffice. That’s why I have several great book recommendations in the study guide that I know will be indispensable to the aspiring professional. Who might find the Advanced study guide helpful? you’re thinking about going professional with tarot and offering your reading services to the public. If that sounds like you and you want to continue your studies with Holistic Tarot, then download this study guide and the recommended supplements. Click on the radio button below to download the PDF. The Study Guide for the Advanced Tarot Student presumes that you have completed the Study Guide for the Intermediate Tarot Student, are proficient with the Rider-Waite-Smith tradition, and have a copy of the Holistic Tarot book. For Session 4 in the Advanced Study Guide, it is also recommended that you have a Tarot de Marseille deck and a Thoth deck to work with. Click on the above button to download the PDF. Also be sure to download and save the below supplements. Note: In traditional esoteric tarot teaching approaches, astrology and the Qabalah basics would be taught at the beginner’s level concomitant with the tarot basics. The approach here is to integrate these areas of knowledge after a strong foundation in tarot has been built. You can order your copy of the book on Amazon, through the publisher’s website at North Atlantic Books, or through the distributor, Random House. All Holistic Tarot study guides and supplements are available for free download here on this website at HOLISTIC TAROT STUDY GUIDES. I hope these study guides are helpful in your learning and if you do use the Advanced Guide, please let me know about your experience with it! I chat with tarot grandmaster Christiana on the Psychic Café about the process of writing Holistic Tarot, using the Rider-Waite-Smith deck, a little bit on the I Ching, and, of course, my signature discursive splattering of chatter. Christiana’s Psychic Café is aired every Sunday at 9 p.m. Eastern time. If you miss it live, you can watch the recording on Christiana’s YouTube channel. She has interviewed some amazing people in tarot and the spiritual community. I’m a loyal follower of the Café. Also be sure to check out Ms. Gaudet’s tarot blog, Tarot Trends. My first book Holistic Tarot was released in paperback this past Tuesday, January 6, and I am grateful for the overwhelming support I have received. First, thank you. To demonstrate how the book can be used as a textbook for independent study of tarot, I’ve created these study guides that will help you navigate the book at a beginner level, intermediate, and advanced. I talked about the Beginner Level here and we’ll get to the Advanced shortly. The following Study Guide is for an Intermediate student in tarot learning under the Rider-Waite-Smith system. you’ve done a minimum of 50 tarot readings (closed book, that is!). All Holistic Tarot study guides and supplements are available for free download here on this website at HOLISTIC TAROT STUDY GUIDES. I hope these study guides are helpful in your learning and if you do use the Intermediate’s Guide, please let me know about your experience with it! 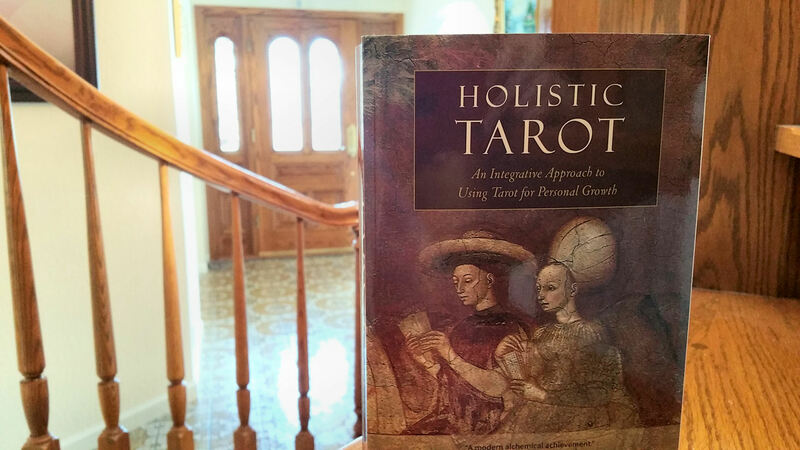 Holistic Tarot is now out in stores! You can order your copy of the book on Amazon, through the publisher’s website at North Atlantic Books, or through the distributor, Random House. I hope you will find the book to be a timeless go-to reference source for all your tarot needs, but I also know that the sheer size of it can be intimidating. So. I’ve created study guides and supplements for free download that will help you navigate the book and learn tarot. These study guides and supplements contain additional exercises and information that dovetail on the contents of the book. The guides are subdivided into sessions with suggested reading, practice work, ruminations, and supplemental downloads that will help you learn tarot on your own and at your own pace. They will help you navigate the book, whether you’re reading at the beginner, intermediate, or advanced level. If you’re just starting out, I recommend following the Study Guide for the Beginner Tarot Student, a syllabus for learning tarot on your own with the Holistic Tarot text. you find it incredulous that anyone in this world could know from memory the meanings to all those cards. All Holistic Tarot study guides and supplements are available for free download here on this website at HOLISTIC TAROT STUDY GUIDES. I hope these study guides are helpful in your learning and if you do use the Beginner’s Guide, please let me know about your experience with it! I had a ton of fun yesterday meeting with all the editors and staff at North Atlantic Books. Love reading (tarot reading) for creative folks. As a tarot practitioner, you really can feel the difference. The air and general vibes have this pulse of energy you just don’t get in any other reading venue. There’s me with the lead editor behind Holistic Tarot, Leslie. Everyone at NAB needs to be thanked, however. Authors always get all the credit for a book, but based on what I’ve witnessed over the last year, me writing the book was the easiest part of it all! What these people do to take my submitted manuscript and transform it into what you see above–and what you’ll be buying, I hope–is truly a miracle of birth. Except, really, it’s no “miracle,” like some sort of divine intervention. (Sorry, Divine!) It was a ton of brute hard work, human effort, picking away at details, editing and editing again… and editing again… and layer after layer of very personalized attention from each and every single person who laid hands on this manuscript. The one Divine part was connecting my book to North Atlantic Books. Everything else was a lot, a lot of love and labor. Okay. That’s enough sap for one day. How do you not adore Kate from Daily Tarot Girl? She’s the author of The Ultimate Tarot Journal, which is a comprehensive tarot journal that is indispensable to anyone who is just starting out in activating their intuitive juices. Outside of tarot, she has many different talents and all sorts of knowledge, which is probably why she’s a great life coach. We chatted for an interview and other than the fact I may have a little too much makeup on and rambled a whole lot, going off on tangents that now in retrospect make no sense, I had a lot of fun. This was my first video interview for Holistic Tarot and I hope the rough-around-the-edges-vibe (from me, not her– oh goodness, Kate was all professional and graceful and stuff) isn’t too off-putting. If you’re looking for a professional tarot reading, I highly recommend contacting Kate. Just watch her weekly card readings to get a great sense of her style.